This ship was part of the Japanese Mosquito Fleet from WWII. 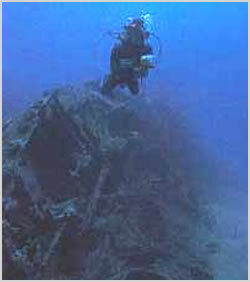 She now lies in 25 meters of water on her side, the bow gun remains intact on this wreck, as does much of the superstructure. Schools of jacks and barracuda are common and there is always the chance of a whale shark sighting during April or May.